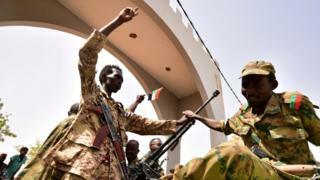 Sudan's President, Omar al-Bashir, has been overthrown in a military coup following widespread street protests against his rule. Reality Check looks back at Sudan's history of military interventions, and the wider picture across the African continent. Including this most recent intervention, there have been 15 - four of them successful. Since the 1950s, there've been a total of 206 coups attempts in Africa, according to a dataset compiled by two US political scientists, Jonathan Powell and Clayton Thyne. Take, for example, Zimbabwe in 2017. The military mounted a takeover to put an end to Robert Mugabe's 37-year rule. At the time, a top military official, Maj Gen Sibusiso Moyo, went on television to deny flatly that it was a military takeover. "Coup leaders almost invariably deny their action was a coup in an effort to appear legitimate," says Powell. Since then there's been a significant decline. In the 2000s there were 22 attempts, and in the current decade the number now stands at 17. "African countries have had the conditions common for coups, like poverty and poor economic performance. When a country has one coup, that's often a harbinger of more coups." Over the past two decades there has been a decline in the number of South American coup attempts. The last was in Venezuela in 2002, against President Hugo Chavez - which ended in failure.